What did Paul three times ask God to take from him? 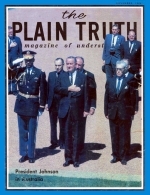 The PLAIN TRUTH sent several of its staff members this summer throughout the Eastern -Bloc countries. They interviewed government, business and professional people, as well as the man in-the-street. They found big changes taking place – changes that will reshape the map of Europe and alter the course of history! Next issue will appear a full photo report on the Iron Curtain countries. The Iron Curtain is no illusion! Its stark reality confronts anyone who has the opportunity of crossing this man-made barrier separating the East from the West. For 1800 miles - from the Baltic to the Black Sea - runs a continuous strip of barbed-wire fencing, often 12 to 15 feet in height, securely set in concrete. On the eastern side of this great barrier stand wooden watchtowers at intervals of half a mile (often between East and West Germany and on the frontiers of Bulgaria and Greece, these gun towers are spaced a few hundred yards of one another). Yet in spite of the Iron Curtain's impressive reality, its real effectiveness as envisioned by its planners is being eaten away by a new kind of rust. That rust is creeping capitalism and a new prosperity.